Binaural beat technology is a way to induce brainwave patterns from beta (awake) to delta (deep sleep). When a sound at a specific frequency is delivered to one ear and a slightly different frequency is delivered to the other ear, the brain senses this difference and generates a specific brain wave from deep in the brainstem (superior olivary nucleus). This entrains the rest of the brain to function at that brainwave frequency for a desired level of consciousness. The process of using binaural beats to change brainwaves is called brainwave entrainment. On an electroencephalogram (EEG), these are the basic types of brainwaves that can be detected. 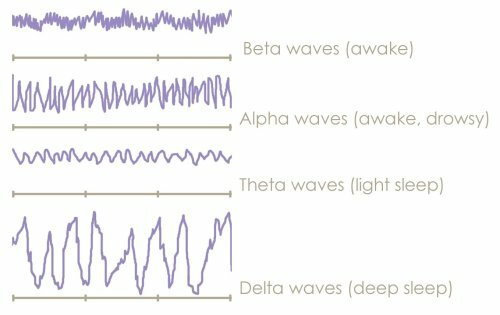 These brainwave tracings show beta (awake) to delta (deep sleep). The specially designed CD includes 2 sleep tracks with binaural beat technology which gradually reduce the brainwave frequency from beta to delta. It also includes a morning track to gently awaken the listener back to beta waves. 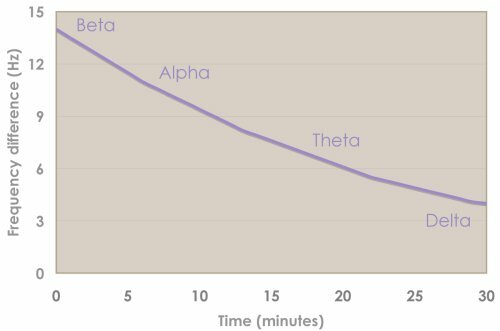 This graph shows how the brainwaves are slowed to induce sleep. Brainwave entrainment with binaural beats may be considered a form of hypnosis as it gently lulls your brain to adapt to a desired frequency. Research articles on binaural beats. Brainwave entrainment requires stereo separation and does not work without headphones. Soft cozy SleepPhones are expertly tailored to deliver binaural beats comfortably all night long. Download a FREE binaural beat track and discover why you need SleepPhones to help you sleep better!